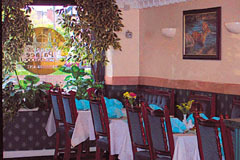 At The Palace Tandoori we believe that the essence of good food is time, so every dish is cooked individually to order. Our speciality dishes are prepared by our master chef who grinds his own herbs and spices (no curry powder) producing meals which are probably the best Indian dishes in the country. Voted “Best Tandoori Restaurant in the Area” – National Curry guide 1998. Mention this restaurant guide and receive 10% off your total bill. Open every day from noon-2.30pm and 6pm-midnight. All major credit cards accepted. No service charge.